Check-out the 3 minutes long official trailer for the 2019 Super Sentai series coming this March: Kishiryu Sentai Ryusoulger! 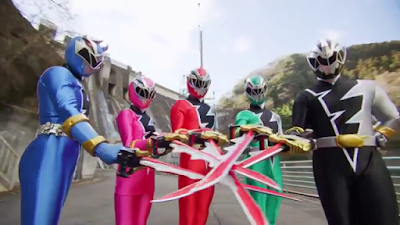 The trailer gives us our first look at the official cast plus the new rangers and Kishiryuoh in action! - It uses elements from older shows, such as Kyoryuger, Gingaman and Shinkenger but giving them an unique mix. So far, I'm sold. - Stupid kid as a recurring character who is definitely yell tasukete a lot and won't be helpful to the team. Please, Toei, don't make him a ranger. Was that ora ora in the end of the trailer a Jojo refference? i can't watch it here in brazil! It looks fun. I was so disappointed with last season so I'm excited to see this maybe go back to its roots and hopefully give us a more compelling story. I don't appear to get a video - just 8 popup ads for gambling sites and dodgy apps.